Fitness facilities often offer a variety of cardiovascular equipment that helps promote well-being and weight loss. But different machines provide different rates of fat loss. While each machine is beneficial for achieving certain fitness goals, several pieces of equipment will give you the upper hand in shedding excess fat and losing inches around your body. To lose 1 lb. of body weight, you must burn 3,500 more calories than you consume. Combine vigorous exercise with a reduced-calorie diet for an effective method of losing weight. However, to help shape your body and burn fat, perform strength-training workouts in conjunction with an aerobic workout routine. Developing muscle helps boost your metabolism to shed even more fat from your body. Use strength-training equipment as well as cardiovascular training equipment for a well-rounded, beneficial workout. The U.S. Department of Health and Human Services recommends that you complete at least two full-body strength-training workouts in addition to a minimum of 75 minutes of intense aerobic exercise a week. Treadmills allow you to walk, jog or run at various speeds and adjust the incline of your workout to mimic mild to vigorous hilly terrain. Run on a treadmill at a speed of 7 mph to burn nearly 1,100 calories, if you weigh at least 205 lbs., according to NutriStrategy. Increase your speed to 10 mph to burn almost 1,500 calories an hour. Although a stationary bicycle might not seem like a top choice for burning fat, the ability to adjust speeds and intensity on this machine can help you burn hundreds of calories. NutriStrategy reports that a vigorous, hour-long workout on a stationary bike burns more than 975 calories per hour for a 205-pound person. Cycling at a moderate pace for a less intense workout burns more than 650 calories in an hour. Tread-climbing machines combine a treadmill workout with a stair-climbing workout to burn a high number of calories in a workout session. 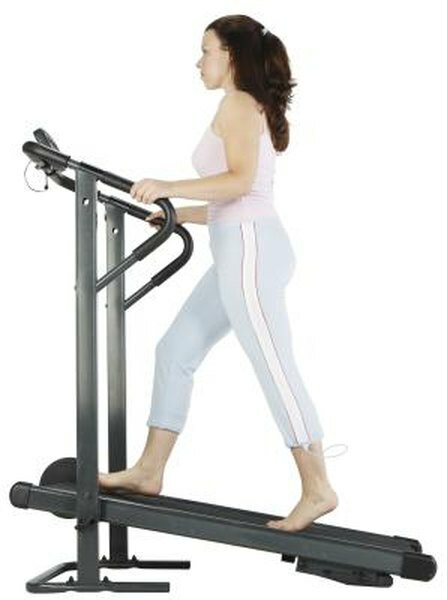 A 200-pound person burns nearly 820 calories an hour using this piece of equipment, according to MayoClinic.com. Adjust your speed and intensity on this machine for an even higher calorie burn.